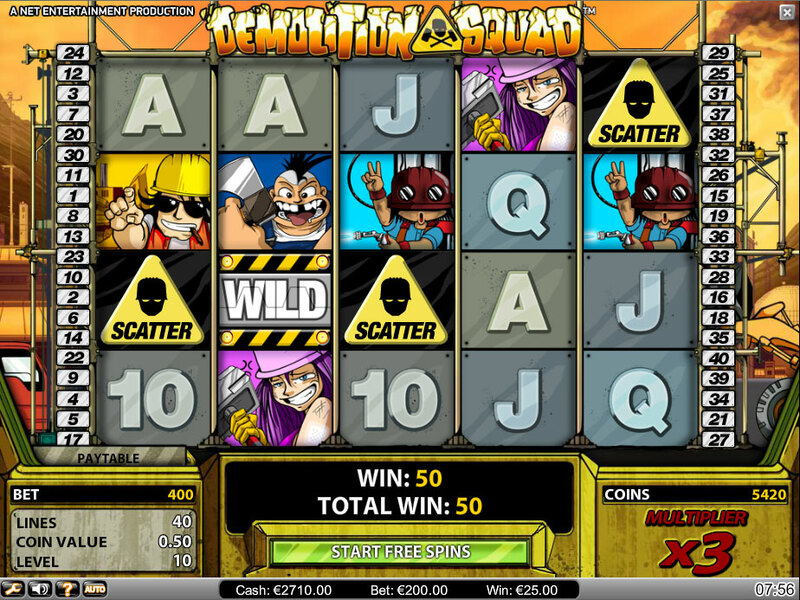 Demolition Squad is an online slot game with five reels and a total of forty pay lines. The number of coins that can be bet on each pay line is anything from one to ten coins. The coin size ranges from denominations of 0.01 up to the maximum amount of 0.50. The slot was developed by Net Entertainment and features wild symbols, free spins, a skill stop feature and an auto play feature. Winning combinations must run consecutively from the furthest left reel towards the right and will only pay out on enabled pay lines. If multiple winning combinations land on multiple pay lines then the winning amounts will be added together and paid out but each pay line will only pay out for one winning combination. The game will automatically pay out for the highest valued combination on each pay line. All pay outs are paid according to the Demolition Squad pay table. The skill stop feature allows the reels to be stopped at any time manually by clicking on the spin button while the reels are spinning. The Demolition Squad auto play feature allows the reels to spin automatically for a pre-set number of times without any interruptions. The feature can however be set to have specific time delays between the spins and certain stop requirements. The theme of Demolition Squad is based on a popular Manga television series of the same name. The Japanese cartoon style story is about a demolition crew which is enhanced by the sound effects, animations and manga styled graphics. The themed symbols include characters from the television show. These are the demolition robot; an axe wielding labourer; torch; the dozer and a purple haired girl whose tool is the sledgehammer. The lower valued symbols are represented by the ten; jack; queen; king and ace playing cards. The themed symbol that displays the warning tape is the Demolition Squad wild symbol. This symbol helps to form winning combinations when it lands adjacent to matching symbols. The only symbol it will not substitute for is the scatter but it acts as a replacement for all the other symbols. If the wild symbol lands on the second and fourth reels then the symbol located between the two turns into a wild. When a win occurs from the use of a wild the amount is multiplied by three. The hard hat area symbols are the ones that represent the Demolition Squad pokies online scatters. The scatter symbols need to appear three, four or five times in any position on the reels to activate the free spins bonus round. Three, four or five scatters award ten, twenty and fifty free spins respectively. If three or more scatters appear at any time during a free spin then another round of ten, twenty or fifty free spins are awarded. There is no limit to the number of free spins that may be awarded consecutively. All wins are multiplied by the same bet amount that was placed on the initial spin that activated the bonus round.